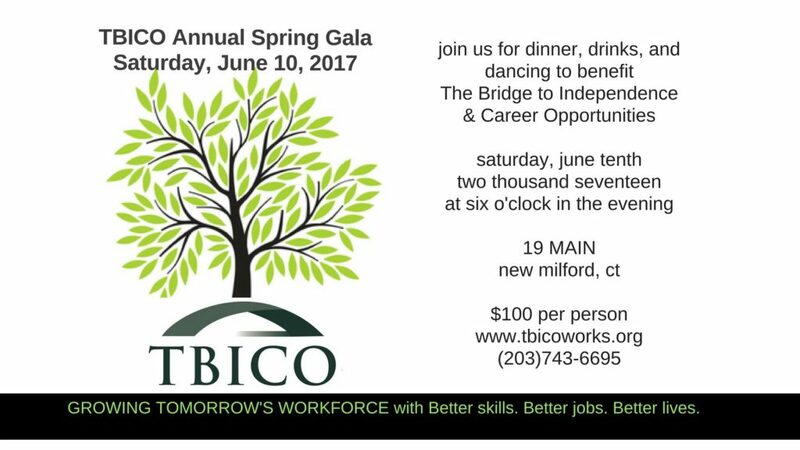 TBICO (The Bridge to Independence & Career Opportunities) will hold its Annual Spring Gala on Saturday, June 10, 2017 at 19 MAIN, located across from the Village Green at 19 Main Street in New Milford, CT at 6:00 PM. This year’s theme is “Growing Tomorrow’s Workforce.” Tickets are $100 per person and include dinner catered by Lucia Ristorante, drinks and dancing to the music of One Plug Entertainment. In addition, there will be a Silent Auction, thanks to local merchants and friends of TBICO for their generous donations. WHO/WHAT IS TBICO: Established in 1993, TBICO provides employment-related support services that allow individuals to compete for better jobs, more stable housing and competent money management capabilities. The programs target skills and workforce training that is in demand by area employers. WHAT TBICO DOES: TBICO teaches people how to take control of their lives. TBICO helps individuals build their own bridge to future success. It is an educational, employment and personal resource center with programs and curricula that blend basic job and life skills with computer and workforce training. Simply put, people come to TBICO for – Better Skills. Better Jobs. Better Lives. WHO TBICO HELPS: TBICO provides support services for adults entering or re-entering the workforce. The majority of participants are female, most are heads of household and many are single parents. In recent years, the number of men coming to TBICO continues to increase, as well. HOW CAN YOU HELP? TBICO relies on the support of individual donors, grants, corporate help and its annual fundraising events to keep its doors open to provide services. This gala remains a vital component in raising funds. Event proceeds will support programs that assist individuals and families at their point of need so that they can overcome fundamental challenges, and achieve stability and self-sufficiency. Funds raised will have a direct impact on the lives of local area individuals. Please call 203-743-6695 or visit www.tbicoworks.org for more information about TBICO, to buy tickets to the event or to make a donation. We welcome the opportunity for an interview. Please call Linda Cyr at 203-743-6695(Ext. 11) or email to lindac@tbicoworks.org.